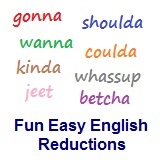 ﻿ Fun Easy English - new-american-english-reductions-reduced-words-topic-word-you-how-do-you-howdya. In this lesson you will learn the American English reduction howdya. How do you make delicious sushi? Howdya get to the bus station? Howdya find time to read every night? Howdya find all these nice rocks? Howdya know is a storm is coming? This reduction is used quite often among native English speakers especially when asking for instructions about the way to do something. Reductions, such as howdya are not real words in English.